Oaklands Wetland has been jointly funded by City of Marion; Adelaide and Mt Lofty Ranges Natural Resources Management Board and the Federal government (through the 'Water for the Future' initiative - National Urban Water and Desalination Plan). Diagrams courtesy City of Marion website. After being closed for most of 2013 for intense redevelopment of what was formerly the Driver Training School, Oaklands Wetland opened to the public on 6th December 2013. Stormwater which runs through the Sturt River (Warri Parri) catchment area will be harvested and reclaimed (through an aquifer storage and recovery system) after filtration by the wetlands. Reportedly one of South Australia's largest urban wetlands, it is projected that when fully functional, the Oaklands Wetland will water up to 20 council reserves with the reclaimed stormwater. 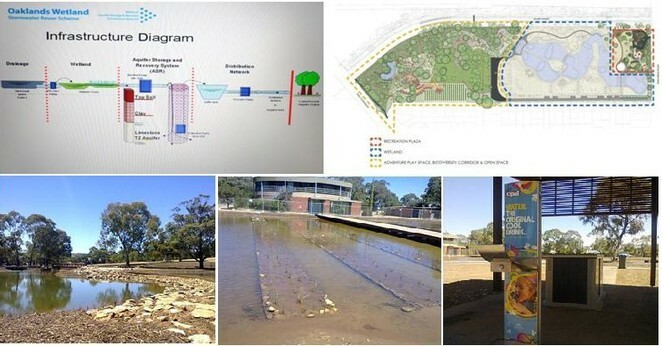 There will be many environmental benefits - of significance will be the improved quality of Sturt River's stormwater before it enters into the Patawalonga River and ultimately into the Gulf St Vincent. The community will benefit from the evolving biodiversity of plants and wildlife. 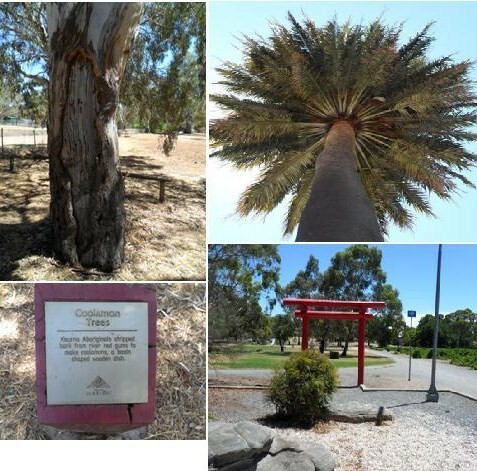 Already existing Kaurna heritage will be enhanced through interpretive signs and educational walks. Reassuringly, Warri Parri's Kaurna heritage will be enhanced and Oaklands Homestead's century-old vineyard and other heritage landmarks will remain. There are plans to update the Japanese garden and install a new adventure playground. From what I understand, remains of the original Oaklands Homestead (established in1843 and returned to public land 1960s) will stay intact which is very reassuring given the age of the vineyard (planted around 1923 for table grape production). To see for yourself, download the draft concept plan here. A truly interesting and innovative development (yet to be completed) will be the Oaklands Recreation Plaza which will include a skate/scooter/BMX park and areas for parkour (lighting and a toilet to be installed) and will be located next to the Roundhouse (formerly the offices of the Driving Training Centre), fronting Oaklands Road. It is anticipated that the Oaklands Recreation Plaza will be completed by end of 2014 - based on existing plans, it's bound to be well received by the youth. A major draw-card of the redevelopment is ongoing community consultation - the community has been encouraged to take ownership as key stakeholders eg. through 'Friends' groups and the existing and long established Oaklands Estate Residents' Association (OERA). The surrounding paths are wheelchair accessible and dogs are welcome (providing they're under effective control). A barbeque area, water fountain, shelters and seating are already in situ. Increased parking space has been created (visitors no longer need to drive right into the Oaklands Estate Reserve parking area). Visitors to Oaklands Wetland must bear in mind that it is still in its infancy - thousands of wetland plants have been planted and are still striving to establish themselves. From what I can see, the Oaklands Wetland has huge potential to make a positive and significant impact on our community and environment. Why? The Oaklands Wetland has huge potential to make a positive and significant impact on our community and environment. Thanks for the update Jenny, I hadn't realised it had opened already.